I was able to read issues 1 – 6 from NetGalley, which comprise the first volume of the comic. For me, I find reading comics a bit different from novels. Which I know is stating the obvious, however with novels all the pictures come out of your own head. It’s your imagination choosing how to portray things. With comics, the pictures are there for you, and it’s something I have to remember to pay attention to as well as the words. Especially because with the more condensed format of the comic, the pictures are a large part of the story and can tell you things that aren’t included in the writing. I find that reading comics is almost harder for me because of this difference. On the other hand, comics allow you to enjoy art that enhances the story. 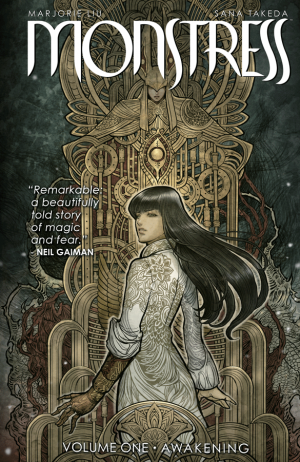 There are so many styles, and the artwork for Monstress is gorgeous. The cover art combined with the title is what drew me in. The story is dark, and can be disturbing, which is reflected in the art. It’s also beautiful. The story is intriguing as well and I want to know more about Maika, and the people she’s picked up as companions. I feel like these characters can not be taken at face value. There’s too much going on for that to be the case. I’m interested in keeping up with this series, but I have a feeling I’ll wait until the other omnibus volumes come out, rather than reading each issue separately. Here’s hoping it doesn’t take too long for the next one!